The pigeon is the top bird pest in urban areas, found huge flocks in every city across Canada, including Toronto. Pigeons adapt very well to city life, losing their fear of humans and easily nesting and roosting on all types of building structures. They can be found in groups of 50 to 500 and can lay eggs up to six times each year in warmer climates. Their success is also based on their diverse diet which includes; grass seed, berries, scavenged human food, insects, caterpillars, spiders as well as bird seed and bread fed by city dwellers. There are numerous products and techniques that can help control pigeon problems, however a multiple method approach is your best bet for a long term solution. The key to controlling and removing pigeons is to make the area unappealing to them. The most effective way to do this is with the use of falconry. Predator birds are very effective at scaring the pigeons away from an area. This combined with other methods such as removing sources of food and physical changes to their roosting and nesting areas are effective long term solutions. Coil, spring wire, spikes, bird points and netting are all additional solutions for pigeon control, but it takes an expert to know when, where and how to use them to have them work. Hawkeye is the #1 Pigeon Control Specialist in the Toronto and Greater Toronto/Golden Horseshoe areas. The most effective solution for pigeon control is the use of falconry. This has to be started early in the year, and timing is critical. Pigeons pose a health hazard to people as they carry Salmonella and Chlamydophila psittaci, a bacteria that causes psittacosis, a serious, although rarely fatal disease for humans. 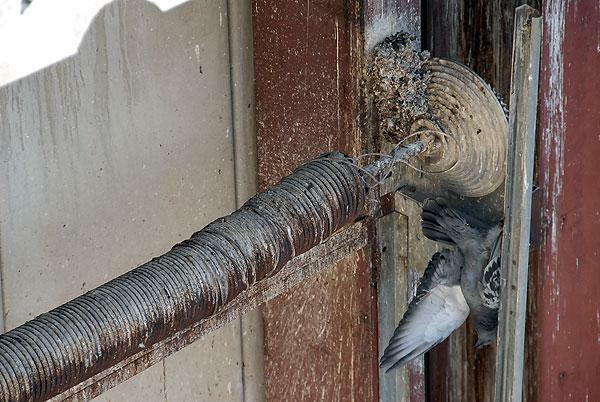 Pigeons cause millions of dollars of damage in urban areas every year. Their feces have uric acid which is extremely corrosive. Pigeon flocks nesting or roosting on a roof will seriously corrode the roofing materials, cutting its life in half. They cause extensive damage to rooftop machinery like air conditioning units. Other economic costs include slip and fall liability, product contamination and risk to company/building reputation as buildings are seen as unclean and dirty. One of the most publicized examples of pigeon damage was the collapse of the 35W Bride in Minneapolis, Minnesota in the summer of 2007. Pigeons do not migrate and they stay close to where they were born, making them determined to roost there. This tendency can cause a lot of grief for the inexperienced pest control company. Each day, pigeons spend the night roosting, feed in the morning and spend the afternoon loafing about, often excreting the digested food eaten that morning. Pigeons build simple nests made up of a few twigs linked together. 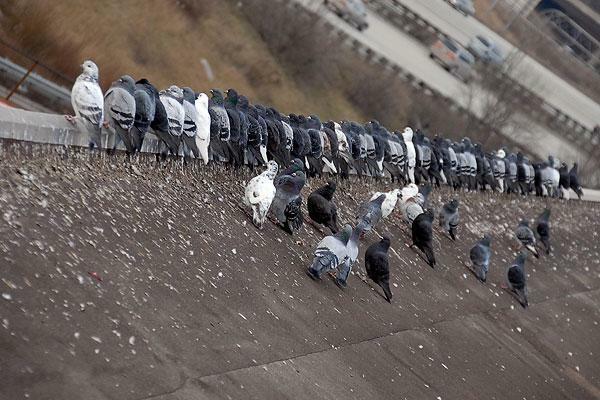 When with large numbers of pigeons, they will lay eggs directly on a protected surface. They will build nests on almost any raised, flat surface including; building ledges, bridges, air conditioner units and window sills. The female will lay several eggs at a time which take approximately eighteen days to hatch. Fledglings (baby birds) take just over a month to leave the nest.